The organised amongst us (quick straw poll in the office: five out of eleven) have already made plans for Christmas. And it seems that we’re all the same – it’s the perennial problem of space. Particularly extra space at the table for larger gatherings of family and friends. We get lots of enquiries around now for ‘large family-friendly dining tables’ and our conclusion is that most of us are looking for something similar. That is, a table that looks uber stylish, works on a day to day basis with family life (i.e. needs to be near bomb proof) and is also clever enough to accommodate 12-16 people at anyone sitting when you need it to. It’s the reliable work horse of the kitchen/dining room. Unless of course you thought that was you! So from this year’s new launches we were particularly pleased to spot some fantastic designs with incredibly hard-wearing tabletop surfaces. They also come in a variety of sizes and some that also have extending versions. Who needs three wise men bearing gifts… we’ll settle for one of these new tables! A major key to choosing a dining table with those indestructible qualities suitable for family breakfasts through to grown-up dinner parties, is in the table top material used. Many of the latest table designs offer up to fifteen different finishes. Look out for the new hard-wearing ceramics, which have the beauty of marble without any of the high maintenance (try taking red wine or even a lemon anywhere near marble…). Ceramic tabletops are made from extremely durable, inorganic clay. Flexible and soft in its natural state, the clay becomes rock-hard after the firing process. This creates a material that is far less prone to scratches and stains than a natural stone, such as marble. Which makes it perfect for messy kids or ‘plate draggers’, alongside those adult wine drinkers who spill more than they drink! And the good news is that a minimalist approach is best when it comes to cleaning. A damp cloth or sponge, plus a mild detergent, will keep a ceramic table top sparkling clean and looking brand new every time. 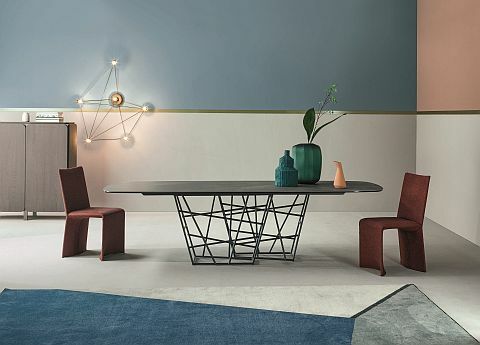 Bonaldo’s new Tangle dining table is designed by Dondoli e Pocci. It’s top of our list for illustrating that you can have style and a table that will survive family life! A ‘tangle’ of trunks and branches was the inspiration for the ‘haphazard’ look of the base. It’s made from structural steel and is both bold and graphic. It’s also available in a selection of colours including white and copper. The family-friendly design has tops in over fifteen different materials including three hard-wearing, family-proof ceramics: Calacatta ceramic, Gold Onice ceramic and, brand new for this year, Ardesia grey ceramic. The latter has a matt finish that is beautifully soft and warm to the touch. Other table-top finishes for the Tangle table include veneers (which are 30mm thick), solid woods, marbles and glass. The Tangle table comes in various family friendly sizes too, the largest from 300cm wide down to the smallest at 180cm. A design that is definitely not ‘art for art’s sake’, is Bonaldo’s Art dining table by Gino Carollo. It has a striking, geometric shape with a metal trapezium base positioned diagonally under the table. Great for optimising the space and allowing plenty of leg room for larger gatherings. Getting stuck with a table leg is definitely the short straw as a diner. It’s also available in three extending sizes and three fixed sizes. Again, there are fifteen different table top materials to choose from including a hard-wearing glossy Calacatta ceramic and the brand new Ardesia matt grey ceramic, which we are really very taken with (in case you hadn’t noticed). The steel base trapezium frame can also be finished in colours and materials such as matt painted dove grey, wood and copper. 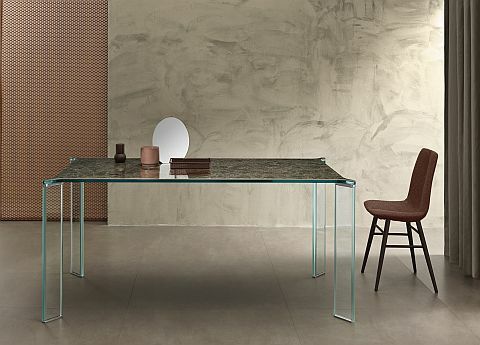 Tonelli Design are best known for their beautiful glass furniture designs. The company was established in the 1980s and they are considered one of Italy’s finest makers of glass furniture, always at the forefront of new technology and innovation. 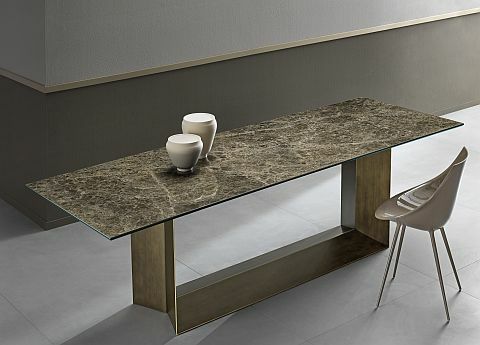 So it’s no surprise that they have taken their hard-earned expertise to combine ceramic with glass for their new range of stylish, family-friendly dining tables. 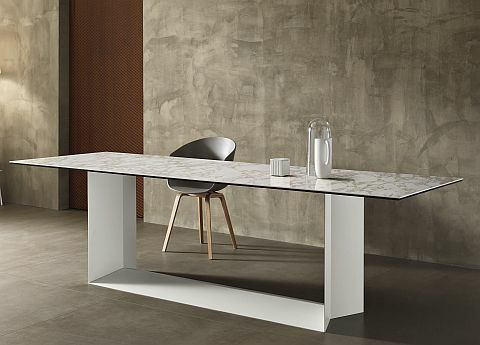 The T5 ceramic dining table by Giulio Mancini for Tonelli features a table top in the company’s new extremely hard-wearing marble-look ceramic glass. 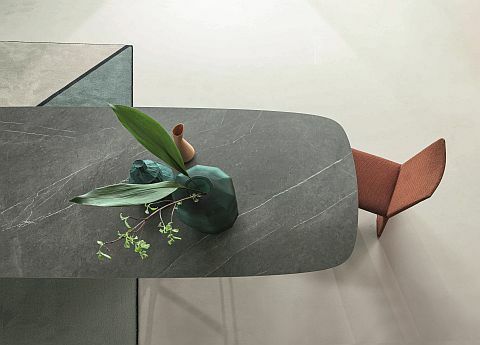 The innovative material comes in a variety of matt and polished finishes including polished Orobic Grey (image above) and matt Noir Desir (below). Also from Tonelli is the Can Can dining table designed by Mario Milana. The ultra stylish Can Can also features the new marble-look, ceramic glass top with six different ceramics to choose from: matt or polished Noir Desir, matt or polished Emperador, polished Orobic Grey or polished Arabesque Calacatta. The unusual angled table legs of the Can Can are available in 40mm thick glass as shown above, or Canaletto Walnut (below) with metal joints in stainless steel, brass or copper. It’s also available in four great sizes from 200cm to 260cm long. New from Porada, a company that has a passion for beautiful wood is the Quadrifoglio, designed by C. Ballabio. It’s a rectangular table with round, solid, recessed legs and a stunning frame in ash. 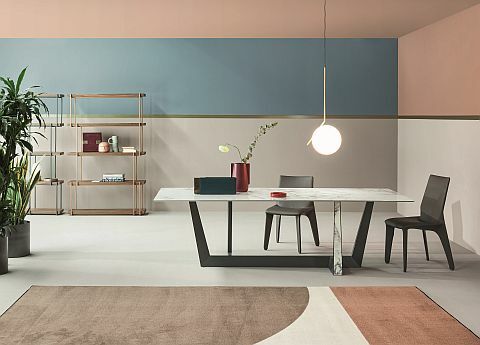 It’s also offered with a range of stains from moka to wengé, or matt lacquered with an open pore finish in interesting colours such as Aviation Blue, Pistachio Green, Garnet Red or simply Natural. What gives the Porada Quadrifoglio its family-friendly credential is the table top ‘insert’ which is also offered in a new ‘rock’ material, including Calacatta, Emperador or matt Oxide Black. ‘Rock’ is a marble composite which is extremely hard-wearing and non-porous. It’s perfect for large gatherings and festive fun! And to maintain the luxurious Porada look all the Quadrifoglio tables are finished with stylish, brushed brass feet. As mentioned, one of the things that’s always at the top of the wish list when choosing a new dining table is how many family and friends you’ll be able to accommodate over normal, every day family meals. Tables obviously take up lots of room. Which is fine if you’ve got room but a bit inconvenient, or even impossible, if you haven’t. So extending tables are the answer. And they come in a variety of shapes and sizes. And to prove that you really don’t have to compromise on contemporary style, some of the newest designs are also offered in an exciting variety of materials and shapes. 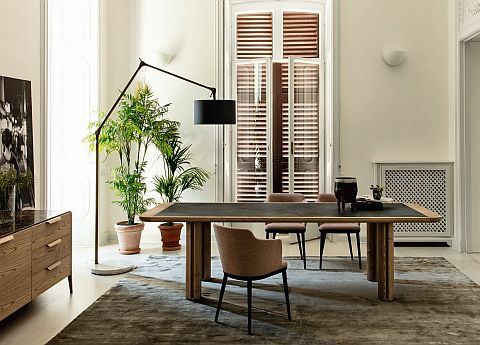 Bonaldo’s award-winning Prora dining table is part of a range that is instantly recognisable. Designed by Mauro Lipparini, the Prora’s legs are shaped to echo the iconic form of a ship’s bow. This latest addition to the collection, and what entitles it to sit within our family-friendly selection, is a new extending glass topped version. Beautifully velvety to the touch and, although not 100% scratch-proof, is much, much more forgiving than standard glass. 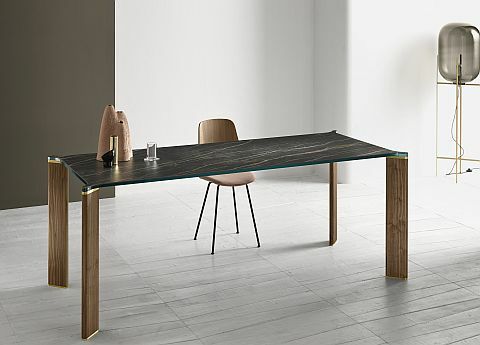 The other big plus is, and unusually, the extensions are also available in the same acid-treated black or white glass as the main body of the table. Which means that none of the core style is lost. So there you have it, highlights from our latest collection of family friendly dining tables for fabulously festive family fun. All you need now is the time to shop for all that food!